We are a full service event management company with over 20 years experience in event management, project management and logistics. Our team has a proven track record and experience combination to host major events. Not just anyone can manage or produce a successful sand sculpting event, it takes years of experience and a passion to get the job done right. Are you willing to take the risk of not having the right team operating your event? We are very proud of our key accomplishments in the sand sculpting industry. Since our Founding we have managed 21 "major" sand sculpting competitions along with dozens of smaller competitions and events. • 2016 - Established the first Advanced Amateur National Championships, as a part of the American Sand Sculpting Championships 30th year. • 2013 - We produced and managed the first ever all women's sand sculpting competition. • 2017, 2016, 2015, 2014, 2013 and 2012 - we managed the largest sand sculpting competition ever held in the state of Florida. 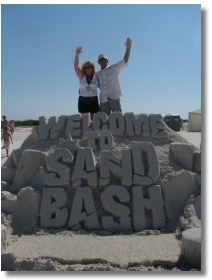 • 2011- we teamed up with the Director of the World Championships and his assistant to manage the World Championship of Sand Sculpting Solo Competition on Fort Myers Beach. 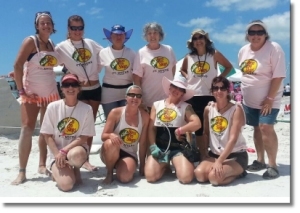 • 2010 - we were a part of the team who founded and established The Crystal Classic on Siesta Key. At this time it was the only doubles competition in the U.S.
• We believe in giving back to the local community, testament of this is the $600,000 our team has directly/indirectly donated to local charities in the past three years. Simple, we have the "proven" experience. Currently we are managing five annual sand sculpting events and each of them are not only successful but, growing each year. Why? Because we do our research to see if the event would (along with many other considerations) be beneficial to the local economy and have sustainability. 100% Turn key - We manage everything, from sculptors to equipment. Project Management - The key to the success of an event: We don't just claim to be project managers, we are educated and certified project managers. We take the time to plan everything. Project, communication and logistic plans are essential to any successful event. Site Development, Set up and management - Including to scale plans/layout. Vendors - We have a database of hundreds of vendors waiting to attend your new event. We are accustom to managing well over 100 vendors for one event. 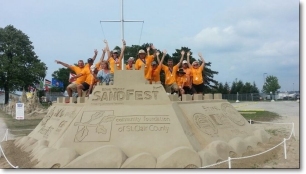 Permitting - Along with permitting over 12 major sand sculpting events, as a previous Town Manager Bill has extensive experience in permitting and working with local, State and Federal Governments. Volunteer Management - Volunteers can be not only a very important part of an event, they can quickly become the backbone. In all of our events, we coordinate and team with hundreds of volunteers. Web site Management - We have been designing, developing and maintaining web sites for well over 10 years. Logistics Planning - One step further than project management. You have to have a firm understanding of logistics to ensure everything arrives on-site at the scheduled time. There are many, many moving parts to operating an event. Poor Logistics cost you money. Licensed, Insured, Bonded - We are licensed, insured and bonded and have been since we opened our company. It's an important question to ask "DO YOU HAVE INSURANCE AND WHAT KIND? "....DO NOT RISK hiring a company that does not have suitable insurance or that is unable to add you as an additional insured on their policy. Consulting - Maybe you don't want to hire us to run your event and just need some guidance, we would love to be your consultant. Budget Management - When it comes to event management, this is one area that is commonly over looked. We have managed sand sculpting budgets exceeding 200k and in the corporate world over 300m dollar budgets. Like we said......100% turn key. The success of our events is not only recognized by our clients but also by our fellow sand sculptors. "Fantastic job you guys did by the way. The solos event was perfect in every way" - Damon Langlois 2011 World Champion. "This was without a doubt the best “World Championship of Sand Sculpting” we’ve been involved with. Together with your wife and business partner Marianne O’Neall Knight, you made sure every detail involved with hosting 32 international sculptors was executed to perfection" - Charles Beaulieu, Director World Championship of Sand Sculpting. "Proud to be chosen for this Campaign"
30th Annual American Sand Sculpting Championships on Fort Myers Beach "Largest Sand Sculpting Competition in Florida" November 18 - November 28, 2016. 29th Annual American Sand Sculpting Championships on Fort Myers Beach "Largest Sand Sculpting Competition in Florida" November 20 - November 29, 2015. 6th Annual Navarre Beach Sand Sculpting Festival National Championship of Soft Pack - Dates TBA. 3rd Annual Blue Water SANDFEST Port Huron Michigan "First Master Level Contest in Michigan"
2nd Annual Blue Water SANDFEST Port Huron Michigan "First Master Level Contest in Michigan"
Blue Water SANDFEST Port Huron Michigan "First Master Level Contest in Michigan"
World Championship of Sand Sculpting (Fort Myers Beach) 2011 - 32 Master Sand Sculptors, 20 amateur teams, 5 pro-am sculptors and 80-100,00 spectators. Siesta Key Crystal Classic 2011 - hosting the World Championships of Sand Sculpting 30 Master Sand Sculptors, 20 amateur teams and over 70,000 spectators. 2nd Annual Navarre Beach Sand Sculpting Festival 2011 - 13 Master Sand Sculptors, 20 amateur teams and over 30,000 spectators. Working with our partners we increased attendance from 6,500 to over 30,000. Siesta Key Crystal Classic 2010 - (inaugural year) 24 Master Sand Sculptors, 20 amateur teams and 60,000 spectators. and countless others......please feel free to ask for our references.